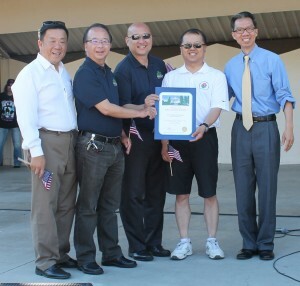 Councilmember Peter Chan, Councilmember Hans Liang and Councilmember Mitch Ing, City Clerk Vince Chang and Assemblymember Ed Chau welcomed everyone to Monterey Park’s 4th of July celebration held at Barnes Park. Councilmember Chan greeted the residents with enjoy our 4th of July! In 1776 our forefathers fought for our freedom. Today please thank our forefathers and our veterans as they fight to give us the peace and the freedoms we enjoy today. 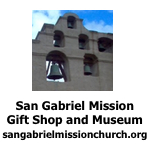 Mayor Teresa Real Sebastian and Mayor Pro Tem Stephen Lam were not able to attend this event today. They send their best wishes to all of you. Councilmember Liang welcomed all to this special event in Monterey Park. Our 4th of July fireworks show. Have a safe and Happy 4th of July! Happy Birthday to us! Councilmember Ing reminded the audience that his grandfather, a veteran of World War II, always told him to love your family, your country and your God. We should celebrate what our veterans have done for us. Please remember the men and women who fight for our freedoms. City Clerk Chang thanked the military for protecting us. He asked the new citizens to please register and vote in the elections. Enjoy the barbeque! Assemblymember Chau said today is our 241th birthday of this great nation. 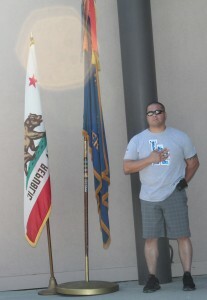 We are fortunate to live here and enjoy our freedoms. He is grateful to see our veterans. He thanked them for their service. Enjoy the day with your friends and family. 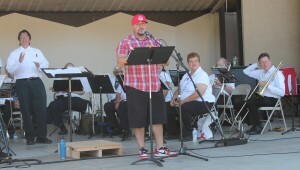 He presented the elected officials with a proclamation in honor of the holiday. New citizens Rong Yan Li and Conchida Ruiz and Mrs. Sapalicio those children, Jess and Gary, are serving in our military were honored by Councilmember Peter Chan, Councilmember Hans Liang and Councilmember Mitch Ing, City Clerk Vince Chang and Assemblymember Ed Chau as part of our 4th of July celebration. Memo Chavez, Recreation Coordinator, earlier welcomed the guests to the city’s party. American Legion Post 397 Commander Gabriel Suarez, Owen Wolff and Joe Hashimoto presented the colors and led our Pledge of Allegiance. Mr. Chavez thanked the members of the American Legion for their participation in our celebration. 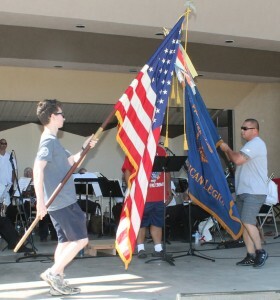 Members of the Monterey Park Concert Band played our National Anthem and several other 4th of July favorites. 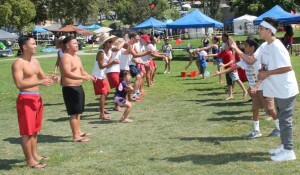 Student lifeguards joined in the games with the younger guests playing Water Balloon Toss and Tug a War. A machine was busy filing the air with light and airy bubbles. Sidewalk chalk was available for children of all ages to express their artist side for everyone to enjoy. 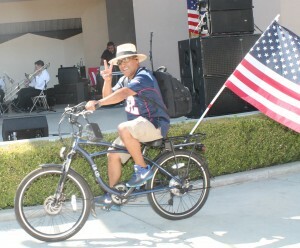 A resident spent the day riding his decorated electric bike around the city as part of his celebration. The air in the park was full of the smell of delicious foods for sale along with ice cold drinks, Jell-O cups, ice pops, popcorn and more. Local service groups were doing their fundraising from these booths. The party included musical performances by “Notes to Notes” with Edwin Alveraz and “Caught Looking”. The 4th of July celebration filled the night sky with colorful fireworks to remind us that our freedoms are not free. O’er the ramparts we watched were so gallantly streaming. And the rocket’s red glare, the bombs bursting in air. 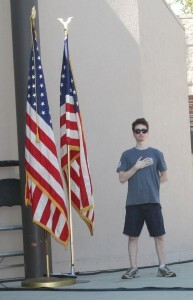 Oh, say, does that star-spangled banner yet wave? Happy Birthday to all of us!